Production Co.: Thomas A. Edison Inc. Director: Harold Shaw. Writer: Dorothy G. Shore. Cast: Martin Fuller (Joe, the newsboy), Mrs. William Bechtel (his grandmother), Bigelow Cooper (the minister), Walter Edwin (the manager of the Fresh Air Fund). Transfer Note: Copied at 18 frames per second from a 35mm print preserved by George Eastman Museum. New Music: Martin Marks. Running Time: 14 minutes. Most one-reel films—considered full-length before multi-reel features gained popularity after 1913—squeeze elaborate plotlines into their quarter-hour running time. The Land Beyond the Sunset, an Edison one-reeler filmed around New York City in 1912, instead takes its unhurried story through diverse genres: from a social-problem drama through a pastoral fantasy and into an unclassifiable poetic finale. a Protestant minister in 1877, pro­vided brief summer trips away from the unhealthy slums. (More than 120 years later, the organization still annually provides vacations for three thousand inner-city New York children to its camps in the Hudson River Valley.) Although Edison collaborated on films with the Red Cross and other charities, one wonders how fully the Fresh Air Fund sanctioned its depiction. The female volunteers, solicitous though they are, lose track of Joe after filling him with a fairy tale about the happy “land beyond the sunset.” He wanders off to find a boat and drifts away into the horizon. Following the inviolable pattern, The Land Beyond the Sunset valorizes the healing powers of the country for urban ills. The little-known director Harold Shaw—the film is sometimes attributed to J. Searle Dawley—clearly had an eye for both landscape and city compositions. Where a D.W. Griffith one-reeler would presume that taking a slum child to the country was in itself a happy ending—see his A Child of the Ghetto (1910)—this film uses fantasy to arrive at a less sanguine resolution. The ambiguity of the final long shot—does Joe die? or drift into a transcendent realm?—makes for something quite rare. For this marvelously crafted, heartfelt, and disturbing film, I turned first to some of Schumann’s piano miniatures from his Album for the Young: notably, an exquisitely simple piece appropriately titled “The Poor Orphan Child.” In addition, I felt a need for a “maternal” soprano voice, singing songs periodically to comment on the film’s meanings. 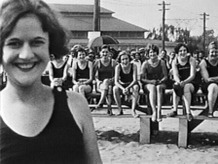 The singer is Margaret O’Keefe (a colleague at MIT), and the selections consist entirely of songs available to singers at the time the film was made. One of these, “Beautiful Isle of Somewhere” (Pounds, Fearis, 1897), was reissued in 1901, after being sung at the funeral of President McKinley. It is heard at the beginning and again near the end of the film, thus constituting a kind of theme song. Indeed, it seems very like the sort of lullaby the boy of the story might imagine being sung to him by his absent mother. For the charitable work of the Fresh Air Fund, see www.freshair.org. Another nonprofit organization, the National Child Labor Committee, collaborated with the Edison company in 1912 to make Children Who Labor, which is included in the More Treasures from American Film Archives DVD set. More Edison one-reelers from the 1910s, preserved by the Museum of Modern Art, can now be seen in Kino International’s 2005 DVD set Edison: The Inven­tion of the Movies.